Low resolution images are useful for online, Facebook, web pages, etc. 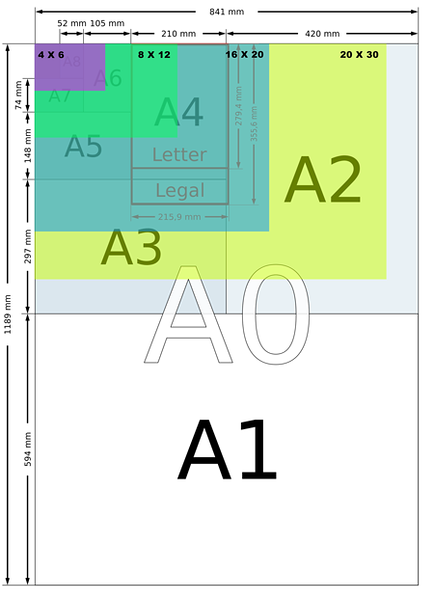 They cannot be scaled up to large sizes and are not suitable for printing. High resolution up to 4Mb - these images are generally suitable for printing up to an A4 size. Original image - most of the original images range between 14Mb to 20Mb in size, the dimensions are 6000 x 4000 pixels with a resolution of 350ppi. What this means is that you can print these images up to approximately A2 size - this does depend on the image though. If you are wondering what the sizes of the images look like in comparison to normal printing sizes have a look at the image below. The original image is from wikipedia however I have superimposed some of the print sizes for the photos on this site.